NASA Mars rocket launch may produce spectacular early morning display over SoCal | Watts Up With That? Remember this fantastic view from a launch in 2015? We might see one that looks similar this weekend in Southern California. NASA is about to do something it has never done before. 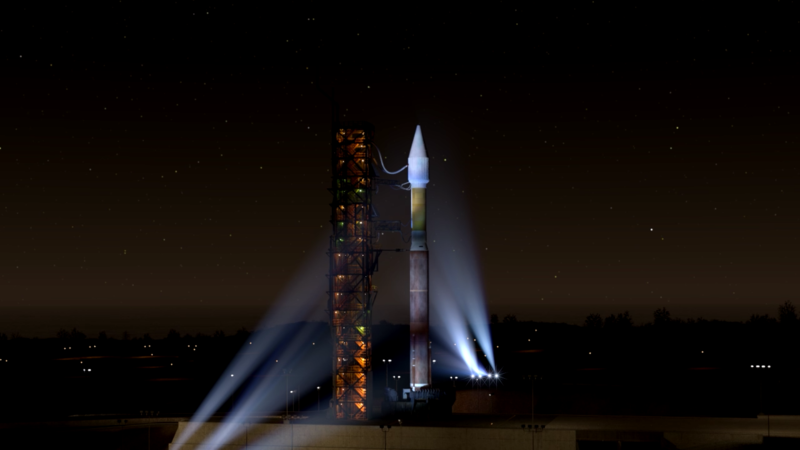 On Saturday, May 5th, the space agency will attempt to launch a rocket to Mars from the west coast of the USA. 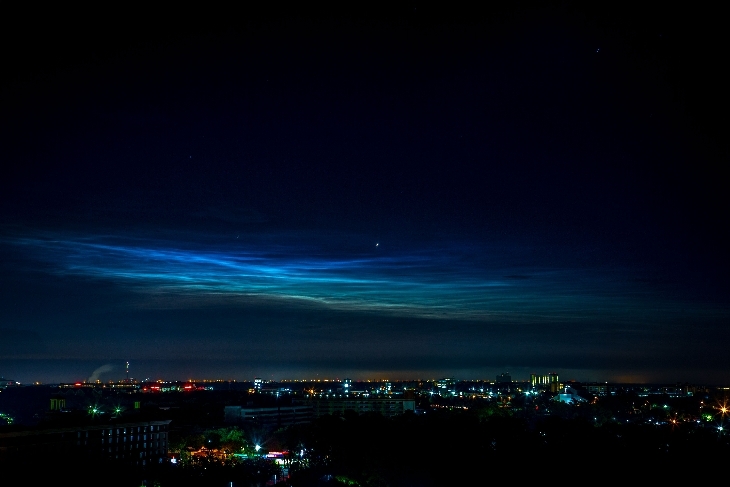 Exhaust from the early-morning liftoff will produce a luminous plume over Southern California and a potential display of artificial noctilucent clouds visible from a wider area. That’s not all. 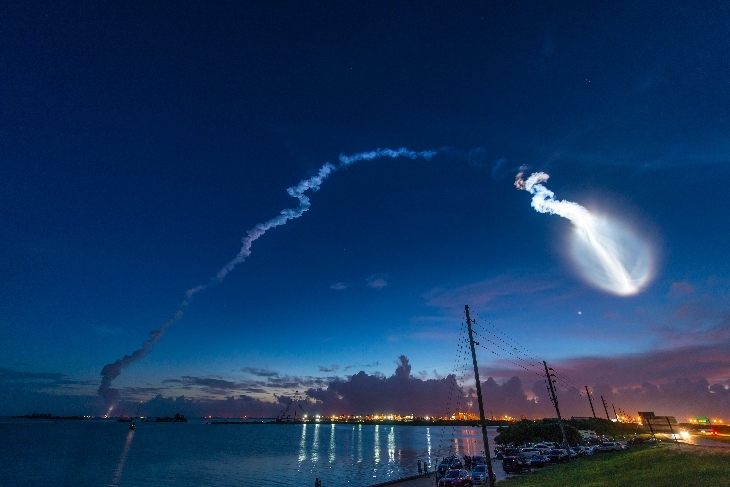 The Atlas 5 might also create a display of man-made noctilucent clouds, which sometimes appear after early-morning rocket launches. Tiny ice crystals in a rocket’s exhaust can catch the rays of the distant rising sun, producing luminous forms in the dark pre-dawn sky. These forms can have striking iridescent colors, although they are typically electric-blue. Noctilucent clouds from previous launches at Vandenberg have been seen as far away as Arizona. If NASA does not launch the rocket on May 5th because of weather or other problems, they could try again the next day. Launch windows are available from May 5th through June 8th. Stay tuned for updates. InSight will be the first mission to another planet to leave Earth from Vandenberg Air Force Base. Missions to other planets normally launch from NASA’s Kennedy Space Center and fly east, over water. That’s because launching towards the east adds the momentum of Earth’s eastward rotation to the launch vehicle’s own thrust. But the Atlas V-401 is powerful enough to fly south towards the sea from Vandenberg Air Force Base. Besides, Vandenberg Air Force Base is more available at this time to accommodate InSight’s five-week launch window. No matter at what particular time and date InSight launches during its launch window, its date with Mars is set for Nov. 26, 2018. May 4, 2018 in Current News. Is it true that Governor Moonbeam will be onboard? We can only hope. Although it would be more appropriate to shoot him to the Moon. Did NASA think to include a gizmo that can definitively measure amount and duration of heat being trapped by the 95% CO2 atmosphere? They could actually help to solve the issue that is perplexing mankind. Of course, NASA’s inability to measure same is quite revealing. Being that Mars’ atmosphere is about 1% of the Earth’s, I wouldn’t expect any detectable warming from the CO2. Once again, percentages do not tell the entire story. How do the partial pressures of CO2 compare for Earth and Mars? If there were an actual ‘greenhouse gas’ physical property of CO2 it would manifest itself in some way. We can’t even set up an equation to derive what we would expect to see. When and how long is the Mars atmosphere warmer because of the CO2? Let’s apply the science. Of course if there is no science to apply then there is no science to apply. You can’t set up a simple “equation” but you can do a line-by-line integration of the absorption of IR by the CO2. As a matter of fact this would be much more meaningful for Mars than for Earth where the wildly varying quantities of the main GHG make such calculations essentially meaningless. Actually it is this huge uncertainty that is the reason for the vast difference between the “party line” climate sensitivity and reality. However I don’t know if anyone has actually done this for Mars. However, there is a confounding factor there too, the global dust storms. Though they cool the surface and heat the upper atmosphere. Therefore, Mars is relatively warm. CO2 GHE? @Dr. Strangelove – need to add “%” to those figures. What is the purpose of this specific trip? Study of the interior of Mars. Seismic studies and more. So if I have it right InSight will land on the surface of Mars and the two suitcases MarCO A & B will establish an orbit for communications back to earth. Will InSight be able to relocate in the future? If the launch window is May 5 through July 9, why would the arrival date be Nov. 26? Trajectories approaching Mars would have to be different with different approach speeds and different delta-V.
Answer (I think). Because it is a lander, a dumb lander where it is far simpler to keep the date, time, approach vector and target all the same for any different launch date. Do the complicated stuff in mid orbit corrections. The cheapest (energy-wise) path to Mars would be a Hohmann transfer orbit. Such an orbit is an ellipse (in this case) that touches the Earth’s orbit and touches Mars’ orbit. The total transfer time is more than 1/2 an Earth year and less than 1/2 a Martian year. Since it would be nice to have Mars at the same place where the Hohmann transfer orbit touches the Martian orbit, you usually leave the Earth about 30 days prior to Mars opposition. Opposition with Mars occurs on July 27, 2018. It appears that NASA isn’t exactly using a Hohmann transfer orbit. Addenda. Don’t most of these missions first orbit before insertion into the transfer? It wouldn’t take much adjustment to the burn at perigee, in that case. I shouldn’t do these from memory. A Hohmann transfer orbit from the Earth to Mars, Mars must lead the Earth by 44 degrees or about 45 days before opposition. Using a modification of Kepler’s third law we can calculate the orbital period from the semi-major axis. The formula is to raise the semi-major axis (in AUs) to the 3/2 power and multiply by 365 days (1 AU -> 365 days). As a test, we can use the semi-major axis of Mars (1.524), and we get 686.7 days. A Hohmann transfer orbit touches the Earth’s orbit (1.0 AU) and touches the Martian orbit (1.524 AU). The major axis is 1.0 AU +1.524 AU = 2.524 AU. The semi-major axis is 1.262 AU. The period of a Hohmann transfer orbit from Earth to Mars is 517 days or 259 days for a half orbit. If we start 45 days before opposition, then we have 214 days before we reach Mars after opposition. 214 days after opposition gives us a date of February 26, 2019. As I said, NASA isn’t exactly using a Hohmann transfer orbit. And? Did it “produce [a] spectacular early morning display over SoCal”? 1. The Atlas may be powerful enough but that doesn’t mean they should waste fuel to do it. 2. “More available” – What does that mean? In 5 weeks both normal launch site and Vandenberg would have regular windows to launch. How can one be ‘more available’ than the other? 3. Did they build the rocket at Vandenberg? A military site? Or are they adding in the transport of hardware to a remote location for some reason? Something seems fishy and it ain’t the anchovies. 2. It depends on the respective launch schedules at each site. “More available” means “more available”. By the way there have been about 15 earlier Atlas 5 launches from Vandenberg, including three previous civilian payloads. Those were satellites that needed to go into very high inclination orbits which are not practical from Cape Canaveral. So, no, nothing very fishy. My guess about “more available” would also include the weather. That is, CA weather has less rain, clouds etc than in the East Coast. So there should be statistically more availability. InSight was originally scheduled to be launched in early 2016, but there was already two Atlas V missions booked to launch from CCAFS in the 2016 window, which meant the pad, SLC-41, might not be available for the normal East coast launch. As InSight is quite light (850Kg) – basically a Delta II class payload, and a Atlas V 401 had been selected (The Delta II no longer being available), VFB was chosen, The 401 can launch approx. 2000Kg to Mars from VFB, so performance not an issue. The 2016 window was missed due to an issue with one of the instruments, so it was rescheduled for the 2018 window (they occur every 26 months) again SLC-41 has been heavily booked, so they stuck with VFB. I could see it from my house in Orange County, California. It was not spectacular because it was not close enough to sun rise.